Announcement Spring has finally arrived on the island and we have hundreds of new designs available in our shop. Browse our handcrafted jewelry, and enjoy original art from 45 local low country artists! Are you a P.E.O.? We have a full line of jewelry perfect for your favorite P.E.O. Handcrafted in Sterling silver and gold, the Marguerite daisy and the gold star never looked so beautiful. Every sale supports the organization. Follow us on Facebook at The Silver Garden and on Pinterest. Look for The Silver Garden designs at The Walter Greer Gallery in The Art Center of Coastal Carolina on Chamber Dr., Hilton Head Island. Currently our jewelry and artwork is on exhibit there as well as our shop. The Silver Garden is open 10 to 5 Monday thru Friday, 11 to 3 on Saturday, and closed Sunday. To watch our latest TV commercial, copy and paste this URL into your browser. Spring has finally arrived on the island and we have hundreds of new designs available in our shop. 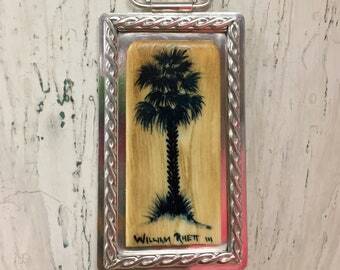 Browse our handcrafted jewelry, and enjoy original art from 45 local low country artists! Read our story in Ch2 Magazine. The Silver Garden was featured in Ch2 Magazine in March. New Larimar Sterling and brass earrings. Mermaids hand wrought in Sterling or 14k gold. Stunning. Hours are 10 to 5 pm daily, 11 to 3 on Saturday and closed Sunday. Jim is in his creative mode designing a copper and sterling pendant. Jewelers bench in place, we are ready to work for you! It is with great excitement that we approach our fifth year of business here on Hilton Head Island. Our shop has been a blessing and we continue to expand our jewelry designs and techniques. Our customers have encouraged us to continue to keep things new and fresh. At any given time you will see sketches laying around the shop of our newest ideas. Our latest designs like the memory cuffs and God's Love line have been very well received and we are adding new pieces all the time. We offer design services, remakes of current pieces and repairs. We are currently offering over 500 pieces on site in our shop. We operate as The Silver Garden HHI on Etsy. Life Is too short to wear department store jewelry! Be sure to stop in and visit us when you are on the island. Jim and I design and make sterling silver jewelry on Hilton Head Island, SC. We opened our doors in 2012 and are located at 32 Palmetto Bay Rd In Mar h 2018 a new all local artisan gallery was added to our shop. Enjoy works from 34 artists. My wife and I design and handmade sterling silver jewelry and also accept commission work. We are able to perform repairs on most items. If you have an idea, we would love to make it a reality. When on the island, stop in and browse our shop. Welcome to our Store. At The Silver Garden, we design and create one of a kind jewelry using only the finest materials. You will find sterling silver, copper and semi precious stones that are presented in an artistic design. We have expanded and now offer original art from 45 local artists. Come in and browse. All of our items are new, except the estate/vintage items, and will be described carefully. we are happy to accept returns on existing items in our shop. We cannot accept returns on custom orders. Returns must be made within 7 days for a refund. Return shipping is the responsibility of the buyer. The photos shown are the actual items that you will receive, unless of course your item is a custom order. Please ask questions prior to purchase. If you desire insurance please notify us upon purchase and we will give you a quote for the additional coverage. In some cases, insurance is included and that will be noted in the details of the item. We accept Paypal, Mastrcard, Visa, Discover and American Express through our Merchant account. Payment is due immediately upon purchase. Please notify us right away if you need to make other arrangements. We ship within 2 business days after purchase, unless it is a custom order. Items will be shipped via USPS first class or Priority mail upon request. We Will provide tracking information. Items will be carefully packaged and will include a new jewelry gift box and hand embroidered muslin bag. Please contact us regarding international shipping. We are happy to ship international, but want to ensure a successful transaction and speedy delivery. We are happy to accept custom orders for size and specific stones for our bracelets and necklaces. Please email with your request and we wil respond with a delivery date. Most items can be produced within 2 to 5 additional business days as long as materials are on hand. Discounts will apply for large orders ie: wedding parties, etc.